Thornleigh Baseball Club runs as a division of the Thornleigh Sports Club. The other divisions of Thornleigh Sports Club cover Soccer, Softball, Netball, Basketball and Cricket. 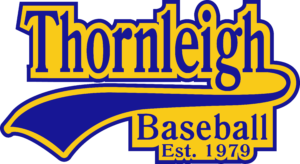 Established in 1979 Thornleigh Baseball entered teams in what was then the Ku-ring-gai Baseball Club competition. Over the years and under various league names and structural changes, this has evolved to the current competitions we are now associated with. Our junior teams play in competitions run by the Ryde Hawks Baseball League (RHBL). Players can start the year they are turning 5 years old. Baseball promotes team play and improves hand eye co-ordination. Teams are mixed and cater for both boys and girls. Games are non-competitive until Under 8s. Seniors play in competitions officiated by Pacific Coast Baseball League (PCBL). RHBL & PCBL set the competition draws and administrate the competitions. Our home grounds are Oakleigh and Ruddock located in Westleigh. Our club is run solely by a small number of hard working volunteers who make up the committee. We also have a number of parents who volunteer every week to be manager, coach, scorer or umpire. We thank all those who volunteer their time for the club. Every single member of the committee loves baseball and hopes that we can continue to spread that love of baseball to the community.